Mackenzie Blackwood's numbers dipped in his second pro season in the New Jersey Devils organization. 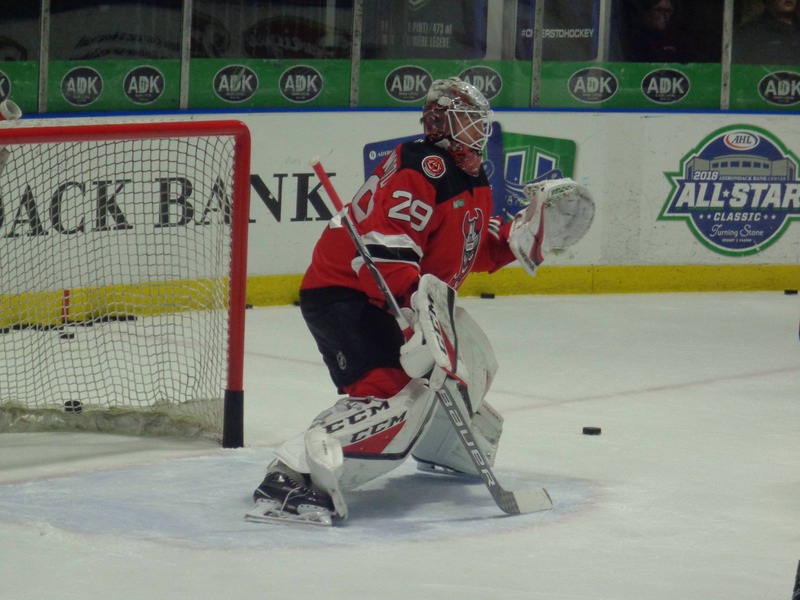 BINGHAMTON - When the Binghamton Devils return to the Floyd L. Maines Veterans Memorial Arena ice on October 5th, there’s going to be a very different look from the team who finished 49 points behind the Toronto Marlies in the North Division, and 25 points out of a playoff spot. The first major changes can be found behind the bench. Head coach Rick Kowalsky, who spent the last 8 seasons as the Devils’ AHL bench boss in Albany and Binghamton, was promoted to assistant coach with the parent club in New Jersey. He was replaced by former Merrimack College head coach Mark Dennehy, who had been hired by the ECHL’s Wheeling Nailers in late May before taking the job in Binghamton. Also new to the Devils bench is former NHL/AHL forward Ryan Parent, who will join holdover Sergei Brylin as Dennehy’s assistant coaches. With Ken Appleby off to Manitoba, and veteran Eddie Lack possibly starting the season in New Jersey thanks to offseason surgery for Cory Schneider, first-year pro Cam Johnson and former second round pick Mackenzie Blackwood will be counted on between the pipes to start the year. Blackwood struggled in his second pro season, going 7-17-6 with a 3.41 goals against average and a .882 save percentage. He would end up going down to the ECHL late in the season, where he seemed to get his groove back with the Adirondack Thunder. In 5 regular season appearances, Blackwood would go 2-1-0 with a 2.48 goals against average and a .920 save percentage. He was the number one in goal as the Thunder made the Kelly Cup playoffs, and he played like it—he started out 3-1-0 with a 1.00 GAA, but a knee injury early in Game 5 of the Thunder’s first round series against the Worcester Railers in late April would end his season. After signing an entry level deal with New Jersey upon finishing his collegiate career at North Dakota, Johnson had a rude introduction to the pro game, giving up 6 goals on 35 shots to the Penguins in his debut in Wilkes-Barre on April 6th. He would finish 0-1-2 with a 3.90 goals against average in three late season starts. Next of the major changes? Offense. Only four of Binghamton’s top 10 scorers are likely to return, with leading scorer and power play leader Jacob MacDonald off to Florida, and veterans Bracken Kearns, Christoph Bertschy, Mario Lucia, and Michael Latta all heading overseas. Depending on who makes the big club out of camp, the likes of veterans Nick Lappin, Kevin Rooney, John Quenneville, and Blake Pietila would likely return. Lappin had a breakout season in 2017-18, with a career high 31 goals in 65 appearances. Quenneville will be looking to rebound after a rash of injuries limited him to 43 games, but he still managed to pick up 34 points in his second pro season. Another veteran addition to the offense is Eric Tangradi, coming over from Grand Rapids. A handful of recent draftees, including Nathan Bastian, Brett Seney (who, coincidentally, played under Dennehy at Merrimack), Joey Anderson, and Mikey McLeod, also will be in the mix for spots up top and in the AHL. The defense may have a big hole to fill with MacDonald’s departure. Veteran Brian Strait returns for his second season in the organization, while free agents Eric Gryba and John Ramage were signed early in July. Josh Jacobs had a solid second season with 16 points in 55 games. Rookie Colton White went back and forth between Binghamton and Adirondack in his first season, with 9 points in 47 AHL games and 4 points in 11 regular season games in the ECHL. He broke out during the Thunder’s playoff run, with 3 goals and 8 assists in 14 appearances. Michael Kapla will also return to the blueline for his second full pro season after finishing with 21 points in 63 games. With youth taking over the Devils organization at all levels, it will be interesting to see how the AHL version will look to improve upon last year’s disappointing performance after making the Calder Cup playoffs in Albany the previous three of their last four seasons.